The vast, flat desert lands stretching out before us, have become our backyard. The short green desert shrubs offer a stark contrast to rich redness of the soil which stains our clothing, our tent and our feet. My memories drift back to the pictures in Primary School. That day, when the teacher returned from his trip to “Ayers Rock” (back then it wasn’t really referred to as Uluru, white man’s name was still more popular). He held up 4×6 photographs, one by one, flicking through to reveal a golden sunset cascading across the grand red rock. There I was, a child, sitting hundreds of Kilometres away from central Australia, in a tiny school of 60 children in the middle of the drought ravaged bush of NSW. There I sat, in awe, wondering if I would ever get the chance to take photos like that myself. That’s the power of the rock. Uluru. The grand heart of Australia. It draws you in. Calls you to it. So here we are. Finally. Almost 15 years later, I was here. The heartland of Australia. Not only did I make it, I was about to take my children, my little people, to stand on the red soils, to see “The Rock”. I knew it would be a special place, but nothing can prepare you for just how special. As the red dirt and shrubbery whiz by, the view out of the car window changes. Or rather it remains the same, other than one bump appearing on the horizon. There, in the distance, a bump, a rock. It looks so tiny. The approach to Uluru is surreal. Looking out the car window feels so similar to viewing Uluru through a TV screen. It looks just like I imagined it would. Just like those photos, those documentaries, the collection of images in my mind seem to do it justice, and it looks so small. We keep driving. All the while our eyes locked on this grand, grand, monolith. The shape changes, the view changes, and the real character of Uluru appears. A weathered exterior, a wounded, battered exterior, ravaged by wind, rain and people, for centuries. The spirits of the land dance around us. Our eyes look up, and up, and up. I breathe in. I’m here. It’s not small anymore. There is just a grandness, the sheer size cannot be described. I breathe it in again. Now all that’s left is to explore, and take those photos. 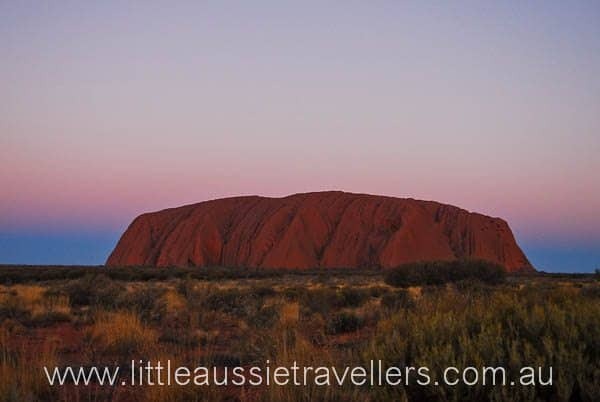 I’ve never been to Uluru, but your account makes me believe it is breathtaking! Once I went to Layland Brothers World (I don’t even know it it still exists) and they had a smaller version that you could climb. I wasn’t allowed to, because I was too little. My brother went though, and thought it was awesome. I’m still jealous! Oh it is breathtaking Daisy! I reaaalllyyy want to go back and do the base walk now our kids are older. Leyland Bros world was turned into a cafe and petrol station! We still drive past it on our way to Sydney. I didn’t get to go there when I was a kid either not for lack of nagging I can assure you lol! 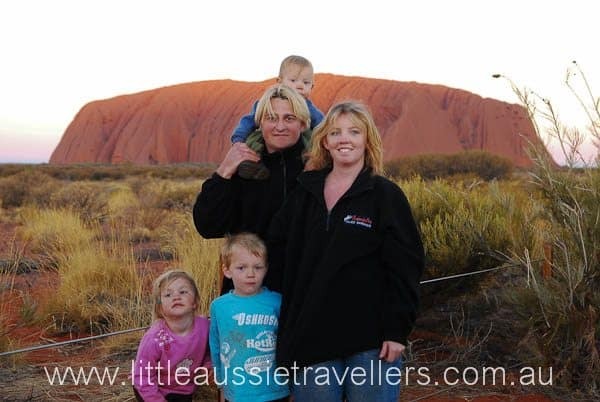 Your account of Uluru was amazing, as I sat and read your story I had goose bumps, we are taking our 5 little boys to Uluru in August and so looking forward to it. Susanne, thanks so much for dropping by. We visited in August, and it was a great time. The daytime weather was great, but it gets VERY cold of a night, so have plenty of warmer clothing with you too. We were camping, and were so tired that I wasn’t sure I’d make it up in time for the sunrise photos. Well, let me tell you, I was so cold that I had no choice to get up so we could all snuggle in the car heater lol! Enjoy your trip, it’s definitely life changing!